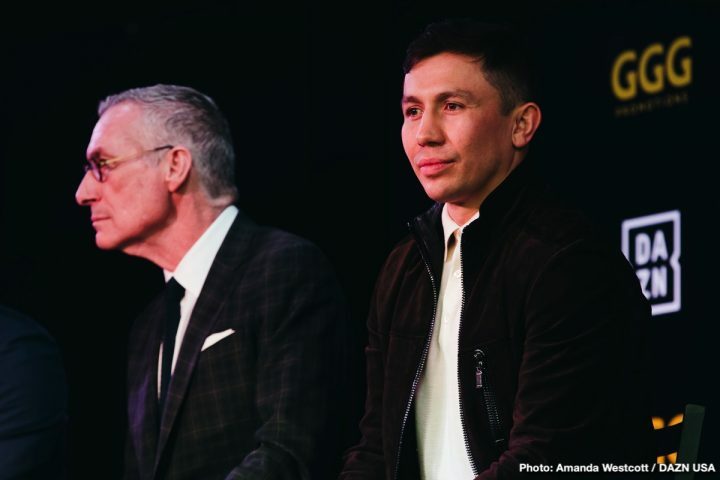 By Dan Ambrose: Gennady Golovkin has started up his training camp in Big Bear, California with trainer Abel Sanchez to ready for his next fight on DAZN in June against an opponent still to be determined. The former IBF/WBA/WBO middleweight champion Golovkin (38-1-1 34 KOs) will be making his debut with his new contract with DAZN in June. Golovkin recently signed a six-fight, three-year deal with DAZN that could possibly take him to the end of his career. “I’m happy to return to the camp, it’s always good to come back,” said Golovkin. There’s a high amount of interest from the boxing public in GGG’s next fight because they want to see how he responds to his recent loss to Saul Canelo Alvarez last September. Some fans think Golovkin isn’t the same fighter he once was because he was backed up by a very aggressive Canelo, who showed a completely different side of his game than he’d shown in the past. Canelo came into the rematch with Golovkin with a chip on his shoulders after having been perceived by the fans as having been given a gift draw in the first fight with the Kazakhstan fighter in September 2017. GGG started his camp on Thursday at Big Bear to ramp up for his next fight. With Golovkin signed to DAZN for a six-fight deal, you can expect him to face a good opponent for his next fight. Some boxing fans are speculating that GGG will be taking a no name or a fighter with limited talent, but that’s not Golovkin’s style. He likes to face the best. Started my camp. Always good to be back. Рад вернуться в свой тренировочный лагерь, особенно в такой праздничный день. Golovkin, 36, still doesn’t have an opponent yet. Canelo reportedly wanted to have the WBO title on the line for his September fight, provided that he gets past IBF middleweight champion Danny Jacobs (35-2, 29 KOs) on May 4, but it’s not likely that GGG will agree to fight Dementrius Andrade in June to try and win his WBO to make Alvarez happy. In the best possible world, Golovkin will fight Andrade in June, and take his WBO belt, and Canelo will beat Jacobs to setup a Canelo-Golovkin III with all four middleweight titles on the line. GGG inking with DAZN in a three-year deal will have him fighting in June, and then likely in September to fight Saul Alvarez (51-1-2, 35 KOs) in a trilogy fight. Canelo beat Golovkin by a 12 round majority decision last September by the scores 115-113, 115-113 and 114-114. The scores were so close that it’s hard for fans to see a true winner in that fight. That’s why Golovkin and Canelo will be meeting for a third time in September. Golovkin signing with DAZN makes the fight with Canelo easily to put together, and very probable for September. It would be good if Canelo gives Golovkin the chance to fight him outside of Las Vegas. Their two previous fights took place at the T-Mobile Arena in Las Vegas, and a lot of boxing fans who feel that GGG won those fights but was robbed by the judges. One way for Canelo and Golden Boy Promotions to make the boxing fans happy would be for them to agree to make the fight with Triple G outside of Nevada. After HBO announced the news recently that they would no longer be televising boxing, GGG had offers from ESPN and Showtime to sign with them, but he elected to ink with DAZN. In signing with DAZN, Golovkin has the ability to fight three of the best middleweights in the division in Canelo, Danny Garcia and Demetrius Andrade. GGG hasn’t been training at Big Bear since his loss to Canelo last September. DAZN’s addition of GGG gives them a big name to bring in subscribers. On Thursday, DAZN revealed they were increasing the monthly subscription price from $10 per month to $19.99. For current subscribers, they’ll continue to get the service at $9.99 per month until March 25, 2020.